Prime Minister David Cameron and his Conservative Party won a surprisingly solid victory in the British general election on Thursday, with nearly complete results Friday morning showing the party had secured an overall majority in Parliament. The vote was a stunning disappointment for the opposition Labour Party and its leader, Ed Miliband, who had shifted the party away from the more centrist strategy it pursued in the late 1990s and early 2000s under Tony Blair. Mr. Miliband stepped down on Friday, opening up a new debate over the party’s direction. 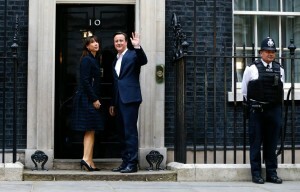 The result defied pre-election opinion polls that suggested a tight race between the Conservatives and Labour. It returns Mr. Cameron to 10 Downing Street for a second term, with enough seats in the House of Commons to act on his agenda without having to rely on support from smaller parties. He went to Buckingham Palace on Friday to be invited by the queen to form a new government. Labour was nearly wiped out in Scotland by the surging Scottish National Party and did more poorly than pre-election opinion polls had suggested it would in the rest of Britain. Several of Mr. Miliband’s top lieutenants lost their seats. “Now the results are still coming in, but this has clearly been a very disappointing and difficult night for the Labour Party,” Mr. Miliband said in a quasi concession speech after being re-elected to his seat in the House of Commons. The results were also a disaster for Nick Clegg and his centrist Liberal Democrats, who have been the junior partner in a coalition with the Conservatives. Mr. Clegg hung on to his seat in the House of Commons, but he resigned as party leader after results that exceeded the party’s very worst expectations.